It's Muffin Tin Monday again! 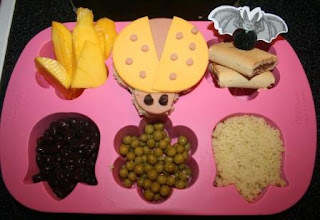 Pierce had slices of mango, an open-faced ladybug sandwich (whole wheat bread, cheese and bologna, black bean eyes), 2 apple fig newtons with a bat (I thought maybe the bat could eat the ladybug if Pierce didn't), black beans, peas, and maggots couscous. In case you didn't figure it out, one of April's themes on Muffin Tin Mom is bugs. Appropriately, Pierce is also studying bugs at preschool right now, so we've been head to toe insects lately at Two Bears Farm. Now, where did that creepy fake camel cricket go? I hope the ladybug gets away from the bat. What a wonderful sandwich! Why didn't we have this stuff made out like this when we were kids? *sighs* the things we do to entice our kids to eat right..
Who ate the camel cricket? I'll have the lady bug bologna sandwich. LOL, you are so creative. I am never eating couscous again. That's too cute, especially the lady bug. He can have the "maggots" though. Hahaha! I'm probably going to think of that next time I have couscous. Maggots ew! Lady bugs cute! What a fun creative tin with all the little creepy crawlies a little boys would love! your flower tin is adorable! and your ladybug! Nice ideas! You are an awesome mom!!!! Oh that sandwich is so cute! This ROCKS!!!! I'm loving your muffin tin lunches!!! I will be making the ladybug for our Anne, she is a little ladybug, you know. That is what they call little girls brought over here from China. They are little ladybugs. Your meals are so adorable, but healthy and well rounded, too!! that is a darn cute sandwich! I was sold until you got to the maggots....ewww! Couscous! That's what we're having for dinner! so cute! going to do that for sure, my kids are studying bugs as well! adorable. I can't stand how cute you are with these!! I'm jealous of your creativity! Those black beans look like a hoard of shiny little bugs too. And the peas kind of like eggs! Ewww! Again, I say...will you be my mommy? What an awesome idea...I know a 4 year old girl who would go crazy for that lunch! I love the fun lunches! Maggots--hilarious! Great job! Very cute tin and lunch!! My mom used to make us 'cupcake lunches' when we were little - same thing - a muffin tin filled with fun food. And now I make them for my son. Our only rule is that you must *try* everything. It works!